Avenida Entre Mares, S/N, 04740 Roquetas De Mar, Spanje. 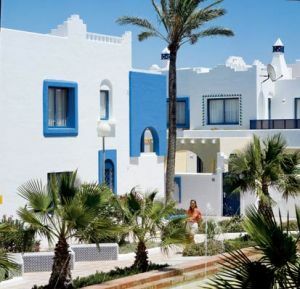 Hotel Apartamentos El Minarete is a complex of 80 apartments semidetached like bunglows of 2 floors, located 500 meters from the beach, 800 meters from Golf court Plya Serena and with its own pool sorrounded by green areas. Its external decorations reminds of typical arabic towns buildings white walls with light blue windows and walls are distributed on a main avenue with gardens. This kind of structure provides independence and quiet, which makes it an ideal option for families. The apartaments all sunny and very light are fully equipped with kitchen living room with sofa bed, balcony or terrace, bed room with two beds and full bath room.